One of the many good things about art is that it can allow the creation of something truly inventive, which it’s hard to see would have an outlet anywhere else. That, by the way, is also one of the problematic things about art – some things just don’t need an outlet. Anyway, I can’t say I loved much about the Biennale on Cockatoo island this weekend. There are a lot of video installations, most of which I just don’t get. But then there was Bush Power by Swiss artists Gerda Steiner and Jorg Lenzlinger – which made it all worthwhile as far as I was concerned. It’s a sort of Rube Golberg machine, meets Maker Faire show, meets art extravaganza which is the perfect fit for an enormous industrial building on Cockatoo Island. The entire thing is powered by exercise machines: Move the machines and clever combinations of wires, levels, bellows and pumps makes all sorts of stuff happen around the cavernous warehouse that houses the exhibit. In addition to being clever, that makes it all interactive and enormously… enjoyable. A walking machine makes a skeleton mimic your movements. A lifting machine powers bellows which in turn make bubbles appear high above your head. A rowing machine sees a flow of air magically suspending a ball, another flow of air shoots multi-coloured feathers to the roof. 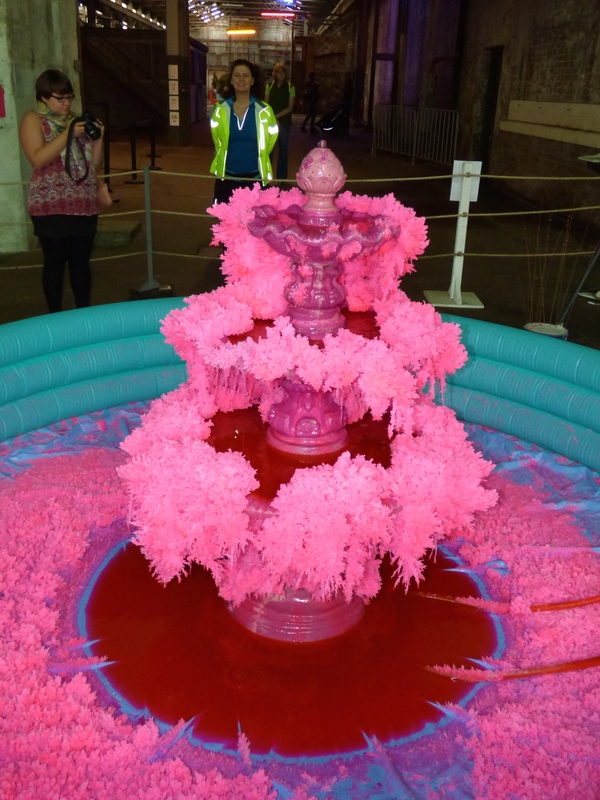 In the center of the room is a large fountain, working a machine pumps water to the top of the fountain where, as it drips down, it leaves a cascade of pink crystals. The whole installation is just such fun and so intriguing. I can’t claim there was anything else geeky to speak of in the Biennale, but a visit just to see Bush Power is worth it. And Cockatoo Island is always worth visiting for the faded industrial remnants. ← John Oliver, Tony Abbott – laugh or cry?